By now you know that J.D. Fortune was chosen as the new lead singer of INXS and that the song he wrote in the "Rock Star: INXS" clinic, "Pretty Vegas" is the first single off the new INXS album. On Friday, following their taping of The Late Late Show with Craig Ferguson, the band convened to discuss video treatments, so we can look forward to that sooner than later. If you live in Los Angeles, you may have already heard the song in high rotation on 95.5 KLOS. Call your local rock radio station and request it today! On Friday, Sept. 23, INXS will appear on Ellen and The Late Show with Craig Ferguson with their new lead singer, J.D. Fortune. 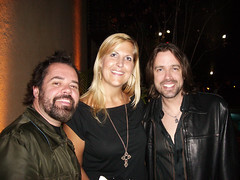 I finally got to meet "Rock Star: INXS" House Band Leader Paul Mirkovich, which I've intended to do for quite some time. I've been a fan of Paul's since the release of After The Rain in 1990. If you happen to be familiar with the interlude on the Nelson album, you probably understand how it started. I dare say that was my favorite album that year and I took much ribbing for being a devoted fan of the twins' band. Despite their talent, they were far too pretty to be taken seriously as musicians and I frequently turned to keyboard player Paul's classically trained background as a musical defense for my passion. I was a tad apprehensive in my introduction, not knowing how the Emmy Award-nominated musician would receive my expression of love and affection for Nelson. I certainly wasn't expecting to be enthusiastically embraced and flashed all smile. Paul was most appreciative of the recognition and said that despite having played with countless professional musicians and composers (Cher, Janet Jackson, Whitesnake, Peter Gabriel, Shawn Colvin and more), that Nelson is the most talented band he was ever part of. I was thrilled to hear this... and will continue to be an unapologetic fan. Unfortunately, he said, the success went to the twins' heads and ultimately lead to the band's demise. I got a little inside info on the rockers, the songs and what's been going on behind the scenes from Paul and the rockers themselves, but will save that for a later post, probably after next week's finale. 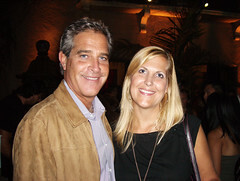 There were other Pauls in the house and I also spent some time chatting with KCBS Anchor Paul Magers. His daughter's friends were visting from Minnesota and are big MiG fans. They had previously seen him in Queen's theatre hit "We Will Rock You" and were very excited their friend's dad was able to secure tix to Sunday's taping and invitations to the mansion. They didn't get to stay as late as me, but by all accounts it was a great time. Did you watch tonight's last performance episode? Marty told me that couldn't believe the audience knew the words to "Trees." As he and Dave Navarro started the acoustic performance, they conferred briefly and determined neither could hear themselves in the monitors due to the crowd drowning them out. The audience also knew the words to J.D. 's original "Pretty Vegas," which, if you ask me, is INXS's single. But what do I know...? Only that Paul Mirkovich is the most wanted keyboard player in Hollywood. For a real review of tonight's episode, go see Joe. On Friday, Aug. 26, Universal CityWalk will host the final six contestants from "Rock Star: INXS" as they perform a series of INXS hits -- including "What You Need," "Don't Change" and Need You Tonight" -- in a free outdoor concert series. The performances will follow a set from the ultimate 80's cover band, The Spazmatics, hosted by Star 98.7 radio personality Richard Blade. So... you can see why the rock stars take precedent. They're not all gonna be around much longer, plus, this will be our first opportunity to hear Jordis and MiG perform INXS songs since they have yet to be in the bottom three. I can only hope the after concert events will be as fabulous as last week's and that Geoff will accept my raincheck. The rock stars and Dave Navarro gave us an acoustic jam which included Jordis singing "The Man Who Sold The World" and "Knockin' On Heaven's Door," but the highlight for me was J.D. taking on my favorite INXS song, "Mystify." Even still, the biggest hit of the night was the Belvedere Rock Startini.